REVIEW – Are you one of those folks who think it’s too cold at work? I’m the opposite! I always think it’s too dang hot. 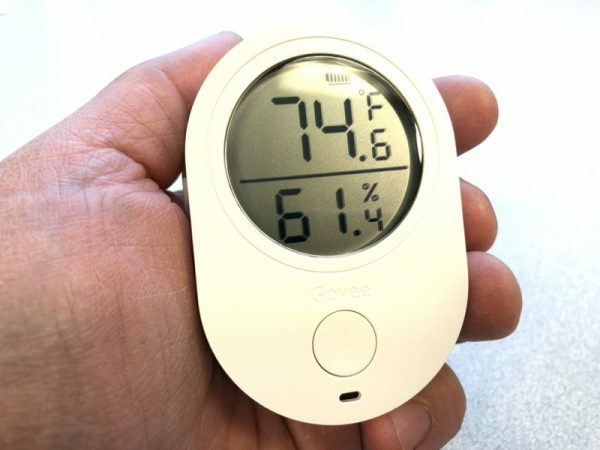 Our office building HVAC system seems a little funny to me sometimes, so I thought something like the Govee wireless thermometer/hygrometer that logs data might come in useful. 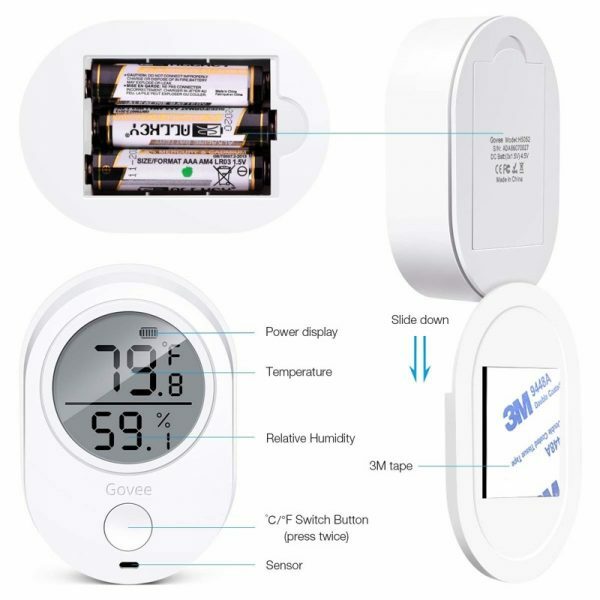 It’s a battery-powered device that displays temperature and relative humidity on an LCD screen. The party trick is the ability to record up to 32,000 data points view the records over your smartphone via bluetooth. You get the Govee device, a mount with peel-off adhesive, and documentation. AAA batteries included! There’s not a whole lot with the device itself. There’s only one button on the front to switch between Celsius and Fahrenheit. 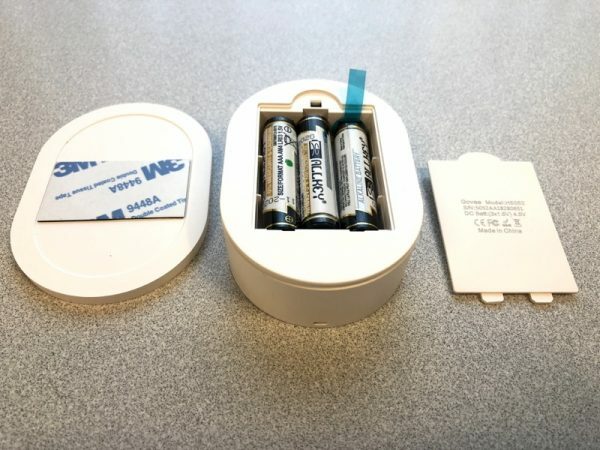 Don’t forget to pull the little plastic tab from the included batteries! The device itself fits in the palm of your hand, with an easy to understand LCD display with a battery icon on top. I downloaded the iOS app “Govee Home”, shown below. It’s free. For some reason, you have to sign up with an email and password. 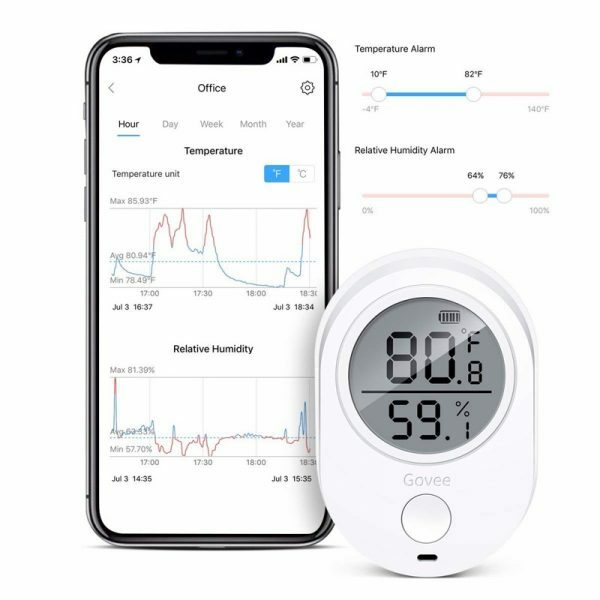 Govee smart thermometer & hygrometer comes with free online cloud storage service, which allow people to store the data of temperature and humidity online. The latest 32,000 data storage is kept in the device itself, which is about 20 days data. We offer TWO YEARS data storage service for free for every customer. Those extra data over 20 days need to keep online, that concerns your account registered in Govee. More than that, once you set up an account with your email address in Govee, you can connect to as many Govee smart thermometer and hygrometer as you can. 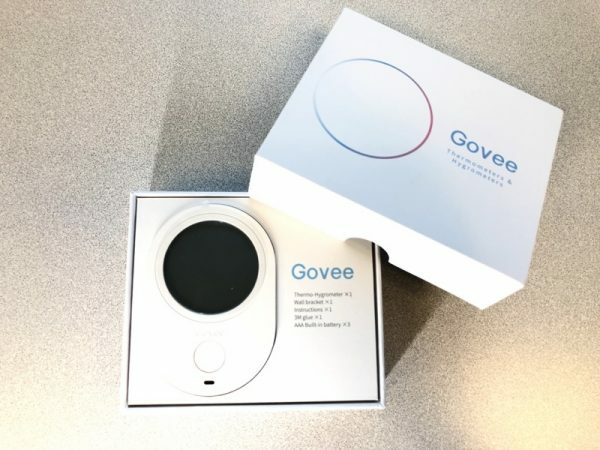 For example, if you have 5 Govee thermometers for different places, you can connect all of them to your Govee account, no extra registration. 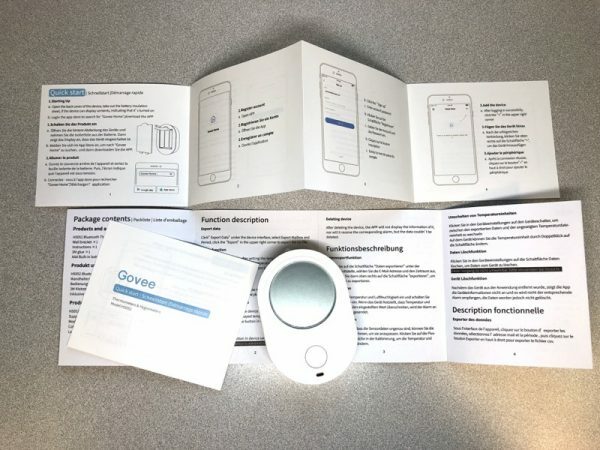 Last but not least, all accounts registered are protected by data encryption service, feel free to use Govee smart thermometer/hygrometer! Actually we have improved the setting up process, that’s the best way we got from over 30 plans! Once your smartphone is paired with your Govee, you can make changes to your settings. Note the temperature alarm slide on the left. I set the upper range to 80F to see what would happen. More on that later. On the right is a snapshot of the data over a brief period. You can slide the records left and right in time. 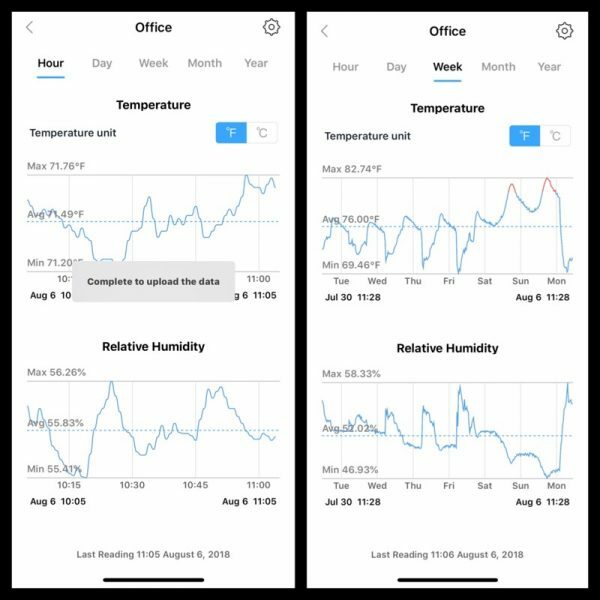 I let the Govee sit in my office for a week to get a sense of what was going on with the temperatures. See the red peaks on late Saturday and Sunday? Those are times when the recorded temperature exceeded the limits I set at 80F. It appears that over the weekend, the air conditioning (what little there is) is shut off to save energy. Simple to set up. Data is easy to interpret on a smartphone. The grammar choices bug me a little, but only if you’re picky! Easy, straightforward, and batteries included. I like it! Source: The sample for this review was provided by Govee. Using the coupon code you so kindly provided, I bought two of these. The biggest disappointment for me regarding this product is the fact you cannot simply stand it upright on a desk or table or counter. I don’t understand why they wouldn’t either simply make the bottom even, or provide a tiny tabletop stand. So, for anyone who might want this for use a stand-upright-on-its-own device, as opposed to either having to lay it flat or attaching it to a wall using the included adhesive piece, this product is not for you. 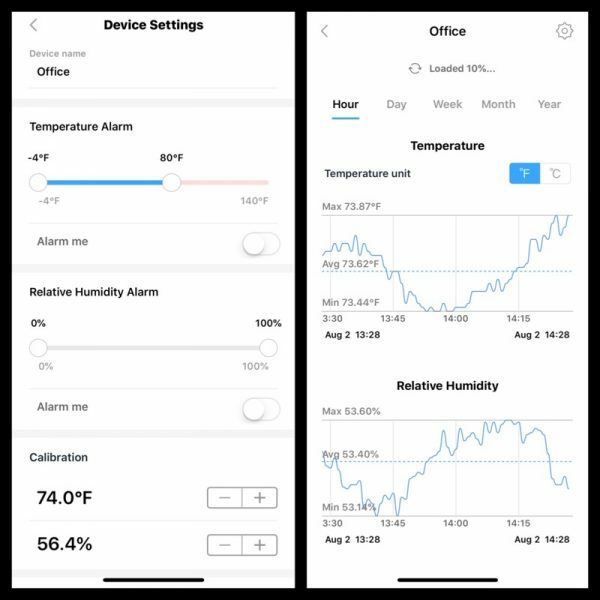 Andy, Apparently you can get an alert from the Govee Home App if the temperature EXCEEDS a given value; what if one is looking to get alerted if the temperature DROPS below a given value, such as winter months in New England. Are there settings for that use? I believe it works that way. Bear in mind you don’t get a wireless phone alert- just a thing on the graph when you connect via bluetooth to the thermometer. Hi Andy, thanks for the review of the Govee Wireless Thermometer/Hygrometer, it was very useful. I’m considering purchasing one of these, for the same reason as you, to monitor our office temperature, which is consistently too hot or too cold! This device should give me some data to present to the office manager. I wonder if you could answer a couple of questions about the way it works? 1. Is it possible to configure the device to take readings less frequently than every 2 seconds? 2. It stores around 20 days of readings, does the device automatically connect to a mobile when it is in range and “dump” the readings or is it necessary to instigate the connection using the mobile app. I suspect this is the case, but just checking. Ideally, I’m looking for a device that records temperatures and then automatically feeds them to a central storage point where they can be viewed and analysed. 3. Does it “remember” which readings have already been sync’d to the mobile, so the next time it is sync’d it only sends readings it hasn’t previously sent? 4. I believe it’s possible to get a csv file containing all the readings. Have you done this? Is that data self explanatory and easy to analyse? 1. I have not found a setting to change sample rate. 2. It appears to dump everything from memory (20 days) of readings. Doesn’t do it automatically. You must launch the app. 3. If you re-sync 10 minutes later, it will retrieve the previous 10 minutes, not all 20 days. 4. I can’t find a way to download data, csv or other. It also mentions this as part of the “How it Works” section, suggesting an email address is required as part of the account setup to enable csv’s to be provided. You’re probably right. I don’t currently have an email set up with this device. I can’t get it connected to my internet. I have a2G/5G internet. Please help before I return it. The Govee support is useless. The model I reviewed has wifi, but only for connecting to your smartphone directly, not a router. I found it would only connect to a WiFi that required a password.